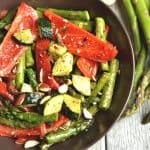 Simple in-season roasted vegetables tossed in a maple dijon sauce that makes a easy and delicious side dish! It’s VEGETABLE season guys!! So listen here lovely readers. I am challenging You, yes YOU, to up the ante when it comes to your vegetable intake for the month. April is the month in which a variety of a TON of new vegetables are starting to taste delicious. It’s that time of year to really fill up on lighter, less comfort-food-type foods. You may find yourself a little tired of the winter vegetables you’ve been consuming since November. Me too!! I love winter, but if there is one thing I look forward to when winter ends, its the plethora of produce that tastes so much better in the spring. 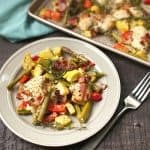 This dish is perfect to throw together as an easy side dish! 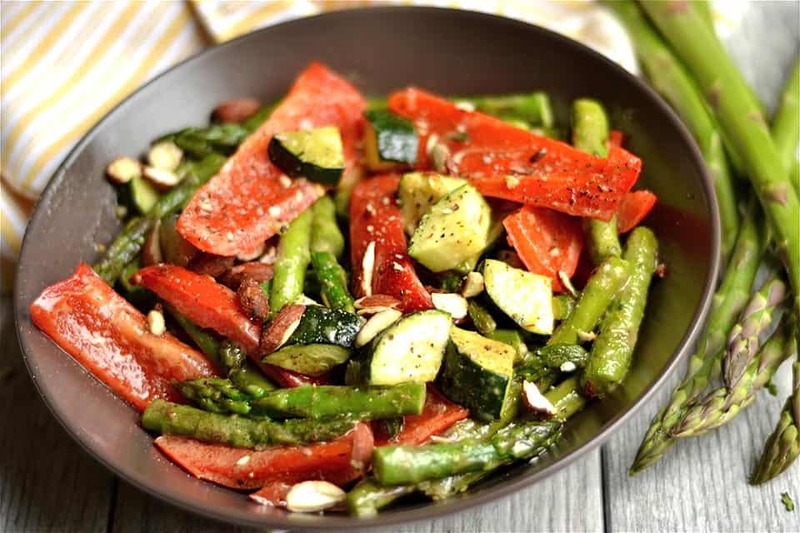 Ditch the starches and use these super yummy vegetables in it’s place with your main dish. It all comes together quickly and easy in your oven. And it’s pretty. I threw together zucchini, asparagus, and red bell pepper here, but feel free to adapt to your own taste. Broccoli, mushrooms, fennel, artichokes, peas, carrots, and so many others would taste fabulous in this easy maple dijon sauce! All I did with this recipe, was chop my vegetables and toss in olive oil. I sprinkled with salt and pepper and roasted in the oven for 25 minutes (ish, you can adjust to your liking). 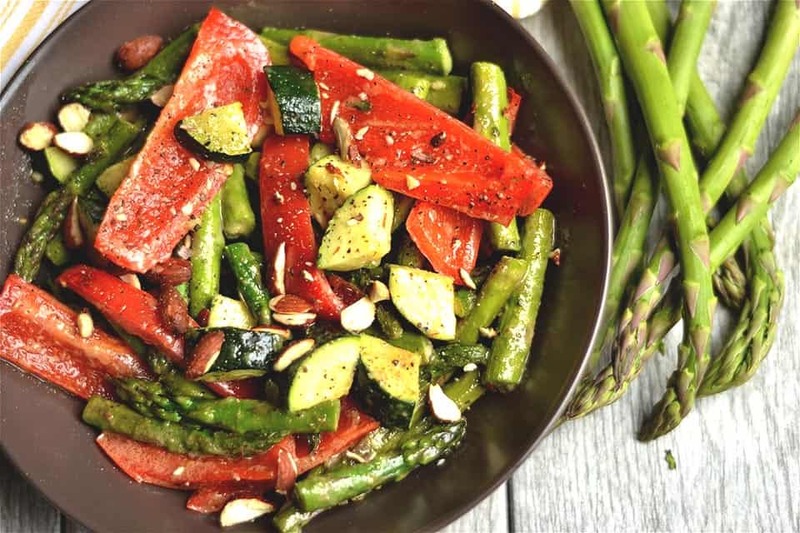 While the veggies are roasting, toss together some olive oil, lemon juice, dijon mustard, and maple syrup. Once your veggies are done, toss with your maple dijon sauce. 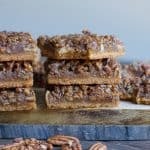 Toss with some some almonds for added crunch, texture, fat, and protein! Sprinkle with additional salt and pepper. We ate this as a side dish to my new Creamy & Smoky Chipotle Pork Chops (Paleo and Whole 30). 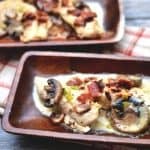 This would also be delicious with one of my most popular recipes: Creamy Maple Dijon Chicken with Bacon. The flavors compliment the dish so well! Enjoy everyone, and HAPPY SPRING!! Prepare your vegetables: trim the edges off the asparagus (stalk end) and discard. Slice remaining stalk into 2 inch pieces. Chop zucchini into 1/4 inch slices (optionally cut each slice into quarters). Slice bell pepper into tall strips or 1 inch chunks. 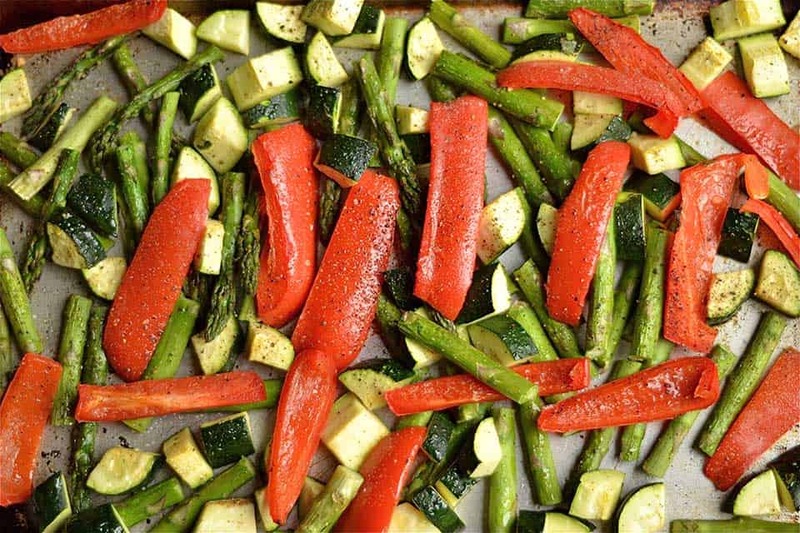 Spread vegetables over a large roasting pan. 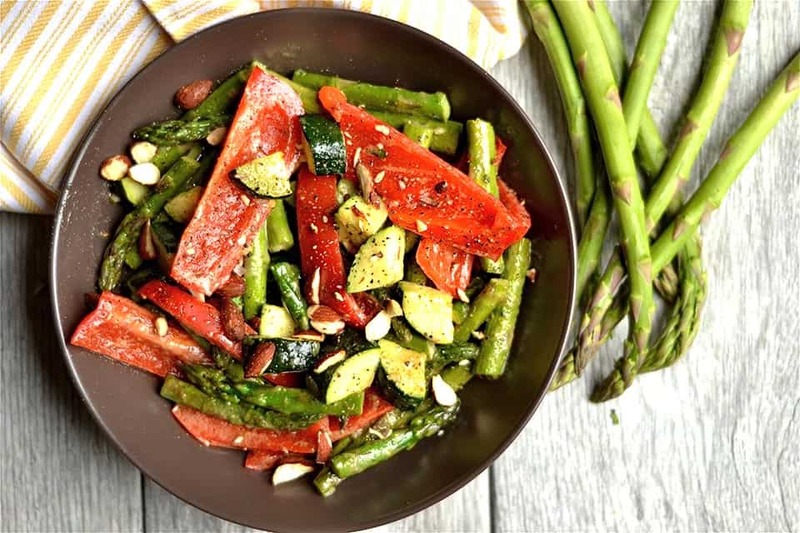 Brush the vegetables with olive oil (using 1-2 tbsp). Sprinkle salt and pepper. Roast for approximately 25 minutes (maybe a little more or less depending on oven). Meanwhile, mix together remaining oil, mustard, syrup, and lemon juice in a small bowl. 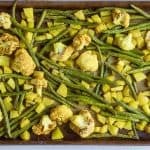 Once vegetables are done roasting, remove and toss with dijon sauce. Sprinkle with more salt and pepper, and add almonds.